We would like to keep you updated on the latest Property Bundles, news, events and updates. Please tick this box to stay updated. WE ARE INTERMEDIARIES, WE DON’T SELL, WE HELP YOU TO INVEST. We have created a wide market place that connects investors with local real estate agencies. Our innovative idea has clear benefits for all stakeholders involved. For small investors, who are interested in real estate investments, we have created a service, allowing them to diversify their investment portfolio anywhere with small investments, by investing in groups of selected properties suggested and managed by trusted European real estate agencies. We aim to become the pan-European real estate crowdfunding platform by engaging local agencies and experts and creating a scalable system. Our network of real estate agencies works for the investors to create value, in a non-competitive manner. EARN FROM CAPITAL GROWTH AND RENTAL INCOME. 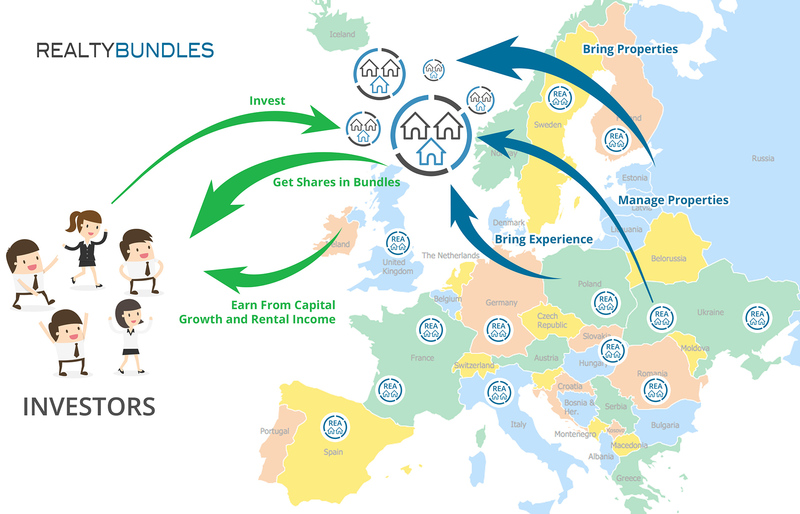 To create value for each property bundle we carefully select properties for bundles to ensure that properties will be bought for good prices, in good locations and, can be rented for the best obtainable price thereafter. We collect rental income from all the properties in a bundle and re-invest it into the property bundle providing higher yields for the investors. Net rental income is collected in property bundle cash on a monthly basis and used to renovate existing properties to increase their value. 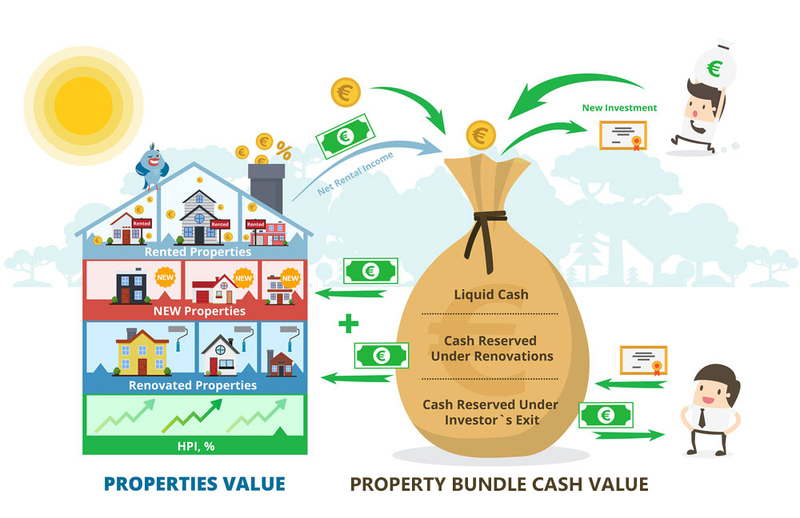 When there is enough money in property bundle cash value, we buy new properties for the property bundle to create additional value for shareholders. We hold a reserve of money in property bundle cash value to support the ongoing operations, maintenance activities and to support the selling orders of the investors. RB continuously analyzes the real estate market trends worldwide and selects attractive locations to seek profits for our investors. We analyze profitability of the markets in terms of yields and create high-quality partnerships to create the investment opportunities and high interest for our investors. When evaluating a property’s value prior to purchasing, RB engages external, trusted and certified expert groups. They evaluate the proposed properties, bringing their own knowledge of the area, the building conditions, and more. RB have a defined property selection procedure and criteria for carefully selecting the properties for the property bundles. A large percentage of the proposed properties are declined and only the best in our opinion are selected; we always aim to have enough liquid cash to purchase the identified deals before others do, thus seeking to create great value for investors. The real estate experts collaborating with our service are external, certified individuals and companies. Their knowledge of local prices is essential to ensure properties are bought at bargain prices. For evaluating a property’s value prior to purchasing and on an ongoing quarterly basis, RB engages with external, trusted and certified expert groups, who evaluate the proposed properties, bringing their own knowledge of the area, the building conditions, and more. In every real estate market and location, we engage trusted legal firms. Their role is to assist in and control the buying and selling of properties. We collaborate with trusted management agencies to provide quality day-to-day management of the properties. Real estate agencies are key partners in our business model; their knowledge of local markets is priceless. They suggest the properties for the property bundles. We provide our investor`s with an easy to use service. All operations can be done online in a few short steps. You can invest, manage your investments, enjoy the performance of your investment and make profits. Your capital is a risk. The value of your investment may go up as well as down. You may lose all your invested capital. Your investment is not covered by the UK Financial Services Compensation Scheme (FSCS) or any other compensation scheme. Investing in start-ups and early stage businesses involves risks, including loss of capital, illiquidity, absence of control, lack of dividends and dilution, and should be done only as part of a diversified portfolio. Investments should only be made by investors who understand these risks. Tax treatment depends on individual circumstances and is subject to change in future. We do not make investment recommendations to you. No communications through this website or any other medium should be construed as an investment recommendation. If you have any questions with respect to legal, financial or tax matters relevant to your interactions with us, you should consult a professional adviser. Please click here to read the full text of Risk Warning. This website has been approved as a financial promotion by Met Facilities LLP which is authorised and regulated by the UK Financial Conduct Authority (FRN: 587084). Realtybundles CFP ltd. is an Appointed Representative (FRN: 781948) of Met Facilities LLP. The investment opportunities listed on this website are not offers to the public in general. Investments can only be made by investors once they have satisfied certain investment criteria. The summary information provided about investment opportunities on this webpage is intended solely to demonstrate the types of investments available on the platform, and any investment decision should be made on the basis of the full campaign/presentation. Full campaigns are available to investors who have become authorised to invest on our platform. Any person resident outside the United Kingdom should ensure that they are not subject to any local regulations before investing. Risk Warning Your capital is at risk. The value of your investment may go up as well as down. Past performance does not indicate future performance. There is no right for compensation in respect of poor investment performance and your investment is not covered by the UK FSCS. Realtybundles CFP ltd. does not provide any advice in relation to the investment opportunities promoted via its Website. Please click here to read the full text of Risk Warning. This website has been approved as a financial promotion by Met Facilities LLP which is authorised and regulated by the UK Financial Conduct Authority (FRN: 587084). Realtybundles CFP ltd. is an Appointed Representative (FRN: 781948) of Met Facilities LLP.